If you’ve taken a course at the Bamfield Marine Sciences Centre, you’ve learned to check the weather before heading out into the field. But what about environmental conditions at the bottom of the ocean? You can find oceanographic data online, and download it from the NEPTUNE Canada network (NEPTUNE Canada, 2012). In Figure 1, I’ve plotted temperature, salinity, and pressure data for September 1, 2012. I downloaded comma separated value (CSV) files from the NEPTUNE Canada website, and plotted these data using the statistics application R (R Core Team, 2012). 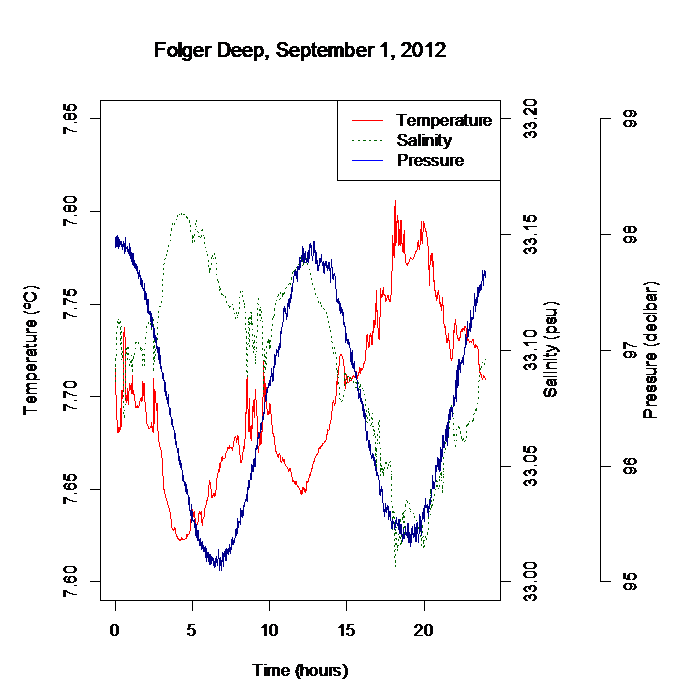 These data are from the conductivity-temperature-depth (CTD) sensor for the Folger Deep site (located near Bamfield) at a depth of 94 m.
Figure 1. Temperature, salinity and pressure plots from the NEPTUNE Canada network site at Folger Deep, for Sept. 1, 2012 (Pacific Standard Time), 48.814 N, 125.281 W. Data source: www.neptunecanada.com (accessed Sept. 24, 2012). R Core Team (2012). R: A language and environment for statistical computing. R Foundation for Statistical Computing, Vienna, Austria.